I can tell that the heavy mist/drizzle has changed over to light rain as I can hear water running down the gutters. Here is a look at the radar from the Paducah, Ky radar site at 8:42pm CT.
As I have been saying all along, the key to tonight and tomorrow morning will be the surface temperature. Through the day temperatures were doing what I thought they would. 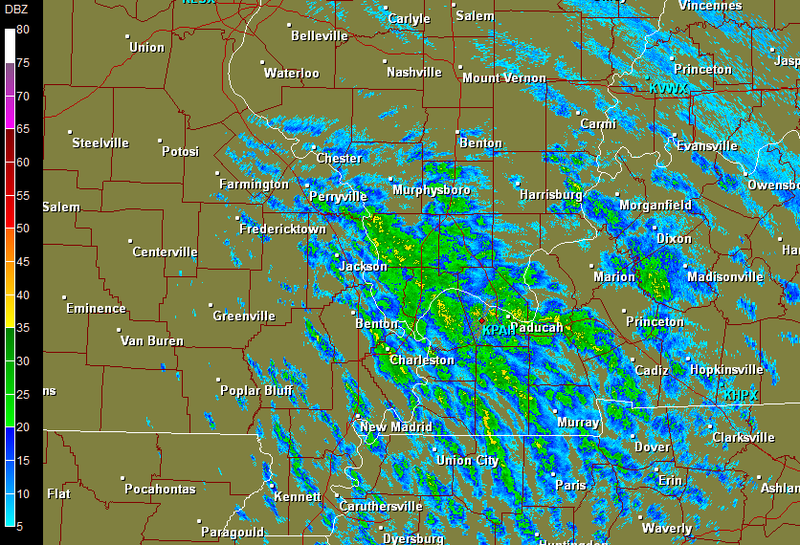 There was a brief "warm-up" in the morning to the mid-30's and then the first wave of moisture started to move through. The moisture didn't come to the ground for the most part. It evaporated and cooled the surrounding air dropping temperatures to 32 degrees or below. Here is a look at temperatures at 8pm CT. Note that temperatures are at or below 32 degrees (freezing) for most of the area with the exception being at Cape Girardeau, Poplar Bluff, and points further south. Some warmer air has worked its way up through southern Missouri, BUT temperatures are barely above freezing. I still think that temperatures will continue to bounce around from 31-33 degrees most of the night. 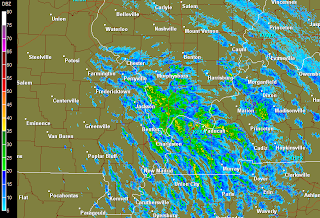 However, across most of southern Illinois (especially north of Vienna, Il) temperatures will stay below freezing. Forecast models are still indicating that freezing rain will be the main threat from this system. Here is a look at NOAA's Rapid Refresh model at 4am CT Thursday. This model keeps most of the area as freezing rain (red/orage slashed lines) with light amounts. It does keep the Missouri bootheel and northwest Tennessee as rain. 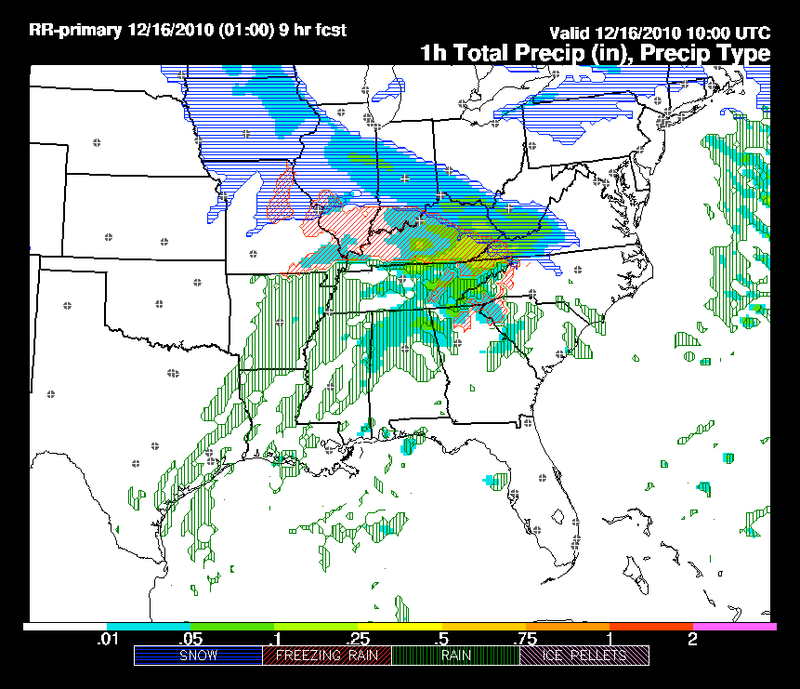 Just like earlier today, the new model data coming in is trying to bring the higher amounts of ice accumulation to portions of southern Illinois. I continue to feel pretty confident with my 0.1" to 0.2" freezing rain/ice amounts. Lesser amounts would be south of Cape Girardeau in southeast Missouri and south of Vienna, IL in southern Illinois and western Kentucky. The city of Cape Girardeau could see 0.07" to 0.1" of ice accumulation. The hardest part about this forecast is determining what the temperatures are going to do. This isn't just splitting hairs, it is splitting the hairs of the already split hairs. We are talking about a couple tenths of a degree one way or the other will make all the difference in the world who sees 0.2" of rain and 0.2" of ice. Unfortunately with this system, I can't give definitive answers as to who is going to see what, with the exception of northern southern Illinois where it will be all freezing rain. I also want to give a mention about snow for people in central and southern Indiana. Looks like my fellow Hoosiers will get a nice little amount. In Indianapolis I think it will range from 1" (northside) to 3" (southside). Areas towards Columbus could see 4"-6" of snow by Thursday night. So does that mean it's kind of iffy in Vienna IL as to whether or not we will be on the high or low end of the ice?